Note: Always check the fan blade on your fan assembly. Bad or unbalanced fan blades can cause premature motor failure due to vibration. If you are not sure what fan blade fits your fan assembly, call us at 734-326-3900. 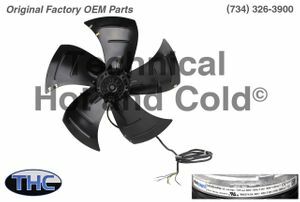 Technical Hot and Cold offers the BKW B700022285 Axial Condenser Fan Motor Assembly OEM replacement part for sale online and over the phone. Call (734)326-3900 to speak with a technician for additional information on each BKW replacement part.